This poster for the La Jolla Museum of Contemporary Art’s exhibition The Modern Chair: Its Origins and Evolution was designed by John van Hamersveld in 1977. Van Hamersveld, a California born and bred graphic designer, is most widely known as the artist behind the iconic 1964 Endless Summer movie poster. Incorporating fluorescent paints and striking graphic language, van Hamersveld brought the beach to mainstream pop culture. The mysterious image of three surfers silhouetted against a nondescript, prismatic horizon evokes the dreamy attitude of the West Coast. Van Hamersveld continued using vivid colors in his designs when he became the art director for Capitol Records in 1967, creating album covers and concert posters for seminal musicians like the Beatles, the Rolling Stones and Jimi Hendrix. Over the course of his career, van Hamersveld has lent his artistry to a wide range of industries and projects, creating the official poster for the 1984 Los Angeles Olympic Games as well as logos for companies like Fatburger and Contempo Casuals. The Cooper Hewitt’s collection includes several other van Hamersveld works, including the Ocean Liners poster, which he designed specifically for the museum in 1980. 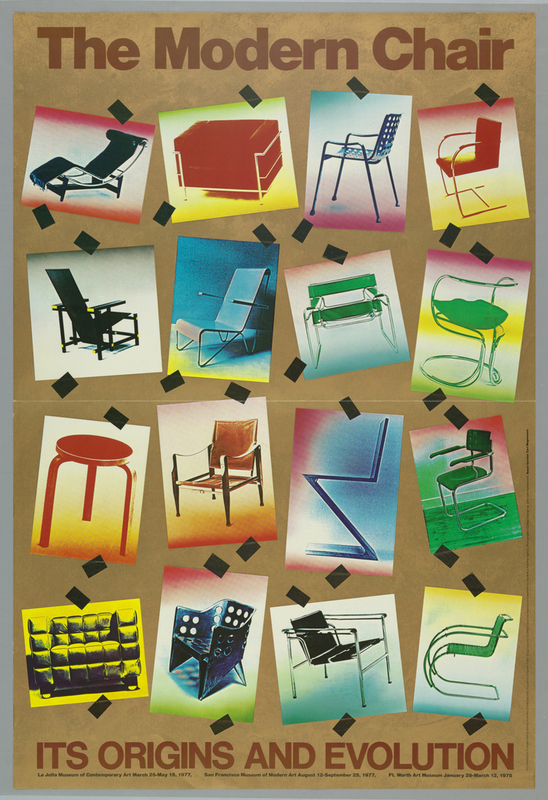 Van Hamersveld’s design for The Modern Chair: Its Origins and Evolution is striking for its application of psychedelic colors within the confines of a conventional exhibition poster. Van Hamersveld took photographs of iconic modern chairs and xeroxed them, spray painting the images with brightly colored dyes. The black tape against the background gives the illusion of cut and pasted pictures, suggesting a spontaneous, organic style. Van Hamersveld said of the design, “Everything, including the sprayed photos with the gold scrubbed background, was in contradiction with what people understood to be a classic and modernist poster.” The onset of new machinery in the early 1970s, like the Heidelberg color lithography press, granted artists the opportunity to experiment with new methods and design compositions. This poster’s synthesis of mechanical images with a “do-it-yourself” aesthetic illuminates the tension between technology and the artist’s hand. With the invention of computers and the onset of the digital age, artists continue to contend with this debate in contemporary design. John Van Hamersveld, John Van Hamersveld: Coolhous Studio (Berkeley, CA: Gingko Press, 2013), 111.